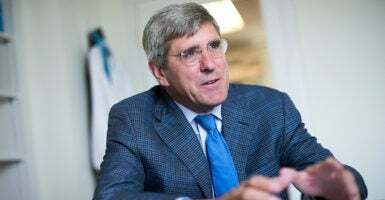 President Donald Trump will name economist Stephen Moore, a visiting fellow at The Heritage Foundation and former Wall Street Journal economics writer, to the Federal Reserve Board to oversee the nation’s monetary policy. Fox’s Neil Cavuto asked him about past criticism of Federal Reserve policies. I believe that the best Fed policy is keeping the price system stable. That’s why you have a currency. I always go back to first principles. Why do you have a currency? So that it retains value. It’s a medium of exchange, and the best way to achieve that is to keep prices stable. … I think the potential for the American economy is 3-4 percent growth for as far as the eye can see. “I’m more worried about a deflation right now than an inflation,” Moore said. Moore, Laffer, and Larry Kudlow, who Trump appointed as director of the National Economic Council, advised the Trump presidential campaign on economic policy. Moore also helped draft the Tax Cuts and Jobs Act, a package of reforms that reduced individual and corporate tax rates while closing loopholes with the aim of spurring the economy. Moore is a distinguished visiting fellow for the Project for Economic Growth at The Heritage Foundation. He had returned to the think tank as chief economist in 2014, after having served as the Grover M. Hermann fellow in budgetary affairs from 1984 to 1987. Steve’s contributions to The Heritage Foundation in his two stints here are too many to count, and the economic policy he played such a large part in shaping during this administration has led to a historic economic boom that has benefitted every American. We encourage the Senate to move swiftly to confirm Steve, who will serve the American people well and faithfully. Between his tenures at Heritage, Moore became known as a member of The Wall Street Journal’s editorial board, writing about the economy and public policy. In 1999, Moore co-founded the Club for Growth, which promotes lower taxes, deregulation, and the election of conservative candidates for public office. 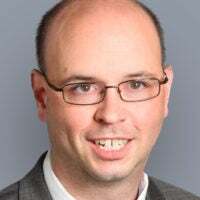 He next founded the Free Enterprise Fund before joining The Wall Street Journal. “Steve is one of America’s leading experts on the economy, and I’ve been proud to co-author several op-eds with him, including one on Federal Reserve policy,” Alfredo Ortiz, president of the Job Creators Network, a business group, said in a prepared statement, noting Moore has been a member of the organization’s board. “We applaud President Trump for making an excellent nomination, one that will bring a much needed and valued perspective to the Federal Reserve Board,” Ortiz said.